Apple basically created the tablet computer market, but it has been more than two years since they released the first generation iPad and no-one has come close to challenging Apple’s supremacy. Amazon’s Kindle Fire made a dent in the tablet market for people looking for a cheap media consumption device, but it is quite underpowered for other tasks. 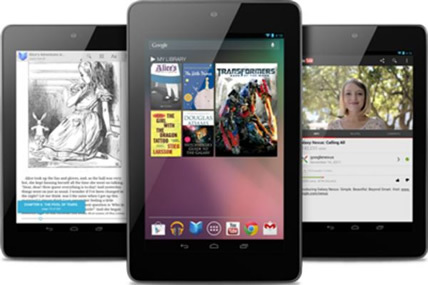 But now Google are officially on the scene with the release of the Nexus 7. Google is looking to regain control of the budget market from Amazon by pricing the device at $199, with a tablet that runs the latest Android 4.1 Jellybean (the Kindle Fire runs a fork of Android 2.3 Gingerbread) and is packing a quad-core nVidia Tegra 3 CPU and a 12-core GPU and a much better display (216 vs 169ppi). It certainly isn’t underpowered then. Google is also releasing the Nexus 7 in the UK as well as the US and other countries whilst the Kindle Fire is still only available in the US. The price of just £159 for the 8GB or £199 for the 16GB model makes it a very attractive option to those currently in the market for buying their first tablet, and Google has recently been rapidly expanding its media offerings. Admittedly it still has a way to go to catch up with Amazon’s streaming services, but with YouTube on its side and a number of media partners in hand it is certain to get there quickly. It is half the price of the comparable 16GB new iPad and that is a huge difference. Previously, Android tablets had been pricing themselves at similar points to the iPad, at which point the allure of the iPad wins out – this pricing should change that. That is not to say that the Nexus 7 is a superior device to the new iPad, however, with the iPad’s retina display still the best on the market by a margin with 264ppi. But the real question comes down to the size – the iPad has a 9,7″ display whilst the Nexus 7’s is just 7″ – halfway between the surprisingly popular 5″ Samsung Galaxy Note and the iPad. The iPad’s size makes it better for watching movies or performing some tasks, whilst the Nexus 7 is only half the weight and more portable – this is where the decisions will be made. If Google also brought out a slightly more expensive Nexus 10, then I would imagine you would see Apple cutting its price to make it competitive again.